At last week’s dedication of the Institute of Arctic Biology’s lovely new building on the University of Alaska Fairbanks campus, I saw more than a dozen people who have appeared in this space since fall 1994 (when I took over this column from Carla Helfferich). 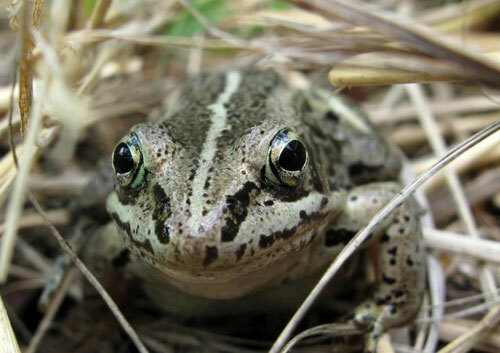 For 50 years, scientists at UAF’s Institute of Arctic Biology have been studying creatures great and small, including the wood frog. I’ve written a lot of words about these biologists because we still know so little about far-north creatures and how they survive here, and Institute of Arctic Biology people have discovered things we did not know. One example is where chickadees roost during winter (often in tiny holes in birch trees, Susan Sharbaugh found). Another is that our rugged version of Alaska wood frogs can survive colder temperatures than Lower 48 wood frogs, which live as far south as Georgia (Brian Barnes and his physiology class uncovered that one). Barnes, who also discovered that Toolik Lake ground squirrels’ body temperatures sometimes dip below 32 degrees Fahrenheit (getting the ground squirrel on the cover of Science magazine), is the director of the institute. As part of the 50th anniversary celebration of that organization, Barnes challenged 24 current and former researchers to sum up their research in just 15 minutes of stage time. •	Black spruce trees came into Alaska about 6,500 years ago, when it was cooler and wetter, said plant ecologist Roger Ruess. Wildfires followed the black spruce into the territory. Because interior Alaska is changing as fast as any place on Earth, hardwoods are shouldering out black spruce. •	Kittiwakes, true “sea gulls” with handsome black wing tips, nest in large colonies in bluffs near the ocean. Every four-to-five years, often after cold springs, chick survival in colonies is zero, said ornithologist Ed Murphy, who studied the birds for years on the western Alaska coast. •	The acreage burned in western North America has doubled in the last 40 years, said ecologist Terry Chapin. If current warming continues, in 50 years Fairbanks will have a climate similar to Saskatoon. “UAF will have the highest predictable (climate) changes of any university,” he said. •	Wolf-control programs could lead to more coyotes eating lambs, said ecologist Laura Prugh. She studies coyote predation on Dall sheep and has found that when snowshoe hare numbers are up, so are coyotes, and more coyotes eat more lambs. Wolf-control could cause “coyote release” (less wolves mean more coyotes, which wolves kill). She also pointed out the state of Alaska practices wolf control in an area larger than the state of Washington. •	Using a snippet of hair, nutritional ecologist Diane O’Brien, using stable-isotope analysis, can determine your approximate intake of sugar-sweetened drinks. Her methods are useful in the studies of what coastal Alaska Natives eat as they combine a traditional diet rich in foods from the ocean and store-bought foods that are almost never from Alaska. Since the late 1970s, the University of Alaska Fairbanks' Geophysical Institute has provided this column free in cooperation with the UAF research community. Ned Rozell [nrozell@gi.alaska.edu] is a science writer for the Geophysical Institute.